The data and technology applications and opportunities coming to Portland change rapidly and grow quickly. 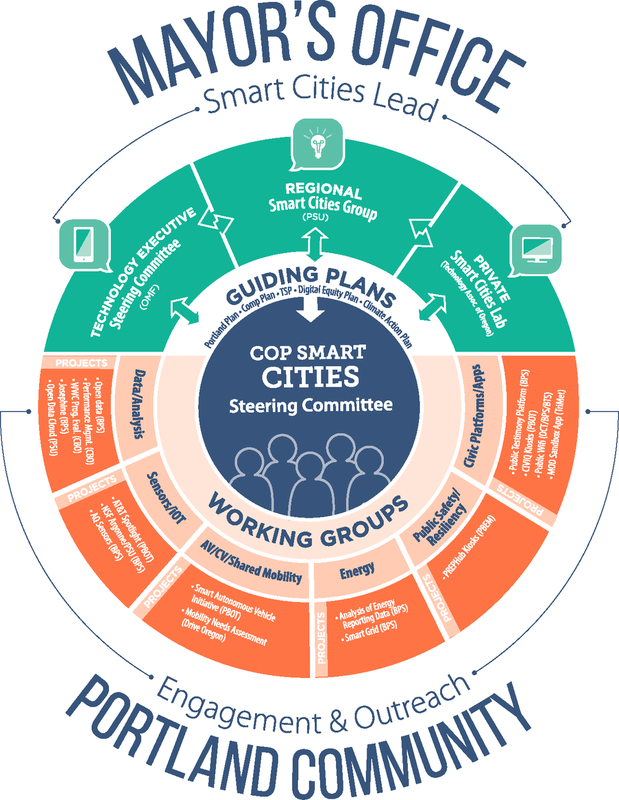 To be proactive and ensure data and technology are used to support our existing City plans, the Mayor and City Council established the Smart Cities Steering Committee (SCSC) to create a citywide governance structure for our Smart Cities efforts (Resolution No. 37290, June 2017). The SCSC shares, manages, and evaluates Smart City policies and projects, funding opportunities, and potential partnerships. Coordination by the SCSC is also key for setting and implementing priorities so that data and technology investments are used to reduce disparities and do not further exacerbate inequities for our Portland community. This coordination effort is lead by the Bureau of Planning and Sustainability on behalf of the Mayor’s Office in partnership PBOT, OCT, and BTS. The SCSC has representatives from all City Commissioner’s Offices and 13 bureaus/offices. Full membership can seen on our team page.